Dr Charles Chabert is the director of The Prostate Clinic and Laparoscopic Urology Australia, a consultant urological surgeon and Assistant Professor at Bond University, Gold Coast, Queensland, Australia. He has been at the forefront of innovation in men’s health for a decade constantly researching and helping to develop novel techniques and treatments with a view to providing the latest therapeutic options for men with prostate based problems. He currently holds clinical appointments at Pindara Private Hospital, the Gold Coast Private Hospital and The Wesley Hospital, Brisbane. Charles is committed to the provision of minimally invasive treatments for conditions affecting the urinary system and has spent over two decades refining the delivery of cutting edge treatments for his patients. Charles attended medical school at Aberdeen University where he was awarded a Bachelor of Medicine and Surgery (MBChB) with distinctions in surgery, anatomy and physiology. His post graduate training was initially in general surgery, culminating with an invitation to become a Member of the Royal College of Surgeons of Edinburgh (MRCS(Ed)). Following this, Charles undertook advanced urological surgical training in NSW during which time he was awarded the Christopher Farrell prize and the George Schnitzler Award for best registrar of the year. On completion of general urologic training, Charles undertook additional sub-specialized training in laparoscopic (keyhole surgery) urology mentored by one of Europe’s pioneering laparoscopic surgeons. Expertise in laparoscopic urological surgery was gained including laparoscopic nerve sparing radical prostatectomy; keyhole prostate surgery for prostate cancer. Whilst on this fellowship Charles also published and presented several papers relating to various aspects of prostate cancer surgery and treatment and reconstructive laparoscopic urology in international medical journals and urological conferences worldwide. Following this, Charles was invited to become a Fellow of the Royal Australasian College of Surgeons (FRACS(Urol)). Since this time Dr Charles Chabert established the first laparoscopic radical prostatectomy program on the Gold Coast in 2008 and has been regularly performing robotic assisted keyhole surgery since it was available in Queensland in 2010. Today, he is the largest volume robotic surgeon on the Gold Coast performing both robotic renal and prostate surgery. Dr Chabert also established the first laparoscopic or keyhole prostatectomy service in rural Australia in Lismore, NSW. At the time of writing Dr Chabert has a combined experience of over 800 cases of keyhole and robotic assisted keyhole prostate surgery with outcomes that are equivalent to those of large published international series. This includes low positive surgical margin rates, excellent urinary continence and potency. Dr Chabert also established the first GreenLight laser prostatectomy (GLP) program in Queensland and is a trainer in this technique. Dr Chabert was integral in the establishment of the GreenLight laser prostate surgery program at St. Vincent’s Private Hospital, Lismore which was the fourth centre in Australia to acquire this technology and the first rural centre nationwide to commence a GLP program in June 2008. Dr Chabert has now performed over 800 cases, the outcomes of which have been presented at state, national and international meetings. He has also been an invited speaker at the nationally and internationally to discuss GreenLight Laser surgery. 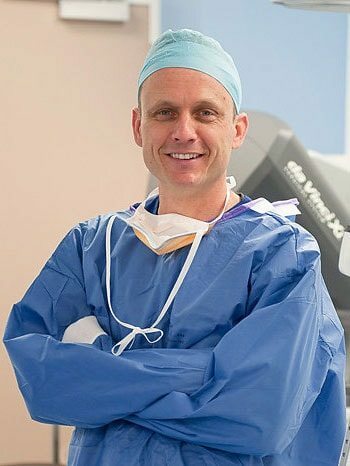 Dr Chabert performs robotic assisted laparoscopic radical prostatectomy (robotic prostate surgery) at the Wesley Hospital, Brisbane and The Gold Coast Private Hospital. He has been involved with robotic surgery since 2006 during his final registrar year at St Vincent’s Hospital Darlinghurst.